Well, it was some pretty funny barf, Russ. But actually, I think most members here will be quite fond of the Beav and clan. Like I said, it deserves another, proper viewing with adult eyes. I think popular culture wrote LITB off as being some sort of epitome of a square, cliched '50s family...but I think it is more self-aware than many people give it credit for. I agree about LITB. These days I consider it to be one of the better family sitcoms from that era. The Donna Reed Show is another one I enjoy, while Father Knows Best feels a little to good to be true for me. Having said that, I know that "Father Knows Best" is very popular on the forum which I completely respect. Flashgear, Rustifer and Jeff Flugel like this. This is cheating because I watched this series via streaming, but I have the DVDs so it's only half-cheating. I enjoyed rewatching the entire run of Gidget...Sally Field was born for the role, and Don Porter is one of tv's best sitcom Dads. He's a widower here which breaks continuity from the movies, but the show was a reboot not a sequel to the films. Gidget's sister and best friend Larue (from the novels as I understand) are present. Funny, sometimes touching episodes that still hold up, and way better than the Flying Nun which followed. There were several surprise guest stars I didn't recall from my last viewing (whenever that was), and I watched an episode with no clue whom I had seen until I saw the name Ron Rifkin (Arvin Sloane from Alias) show up in the closing credits. It took me a while to I.D. him: even when I rewatched the scene knowing who it was, I had trouble recognizing him! All this set off my curiosity about the tv movies that followed. The only one I remember seeing was the first: Gidget Grows Up with Karen Valentine. She goes to NY, falls for a MUCH older man (Edward Mullhare, not a ghost here), and gets a job at the UN. Easily the best of the tv movie follow-ups. Nice use of NYC locations, Bob Cummings is Russ, and Paul Lynde chews the scenery (a bit too much IMHO) as her movie-buff landlord. No mention of best friend Larue or Gidget's sister. A brief scene at Dad's house looks like the same set used for the series. Gidget Gets Married is pretty grim: Monie Ellis is OK, but Michael Burns (aka Blue Boy from Dragnet) is nobody's idea of Moondoggie. It's a direct sequel to Gidget Grows Up, several characters are referenced from the previous film, and Paul Lynde is back. The ceremony itself is nice, but the rest is contrived and generic. Gidget's Summer Reunion was the pilot for a pretty awful sitcom but on its own easily better than GGM. There is an indirect reference to Gidget's sister via the presence of Gidget's niece, Larue is back, and William Schallert is the archetypical tv Dad. The plot (workaholic marrieds) isn't much different from GGM but at least there's some surfing from a real pro (Don Stroud). Continuity with the previous entries is pretty sketchy. Jeff's at a different job from GGM, has changed from an engineer to an architect, and they're back living in California again. Even his last name is different! They reflect back to how their married life began, living in an apartment in Florida, which is nothing like what happened in GGM. But Gidget (Caryn Richman) does get off one 'Toodles! ', a flashback to Sally Field. None of the three successors can match Sally Field, but Karen Valentine is pretty good in the part. Caryn next, and Monie Ellis comes in third. Flashgear, Jeff Flugel and Rustifer like this. This is cheating because I watched this series via streaming, but I have the DVDs so it's only half-cheating. Nah, Mark. I've been assured by several upstanding members in this thread that watching a favorite show on mediums other than DVDs is okey-dokey. Especially if you share a really good commentary like you have on Gidget. I'm a big fan of both the TV series and the movies for no other reason that they were comforting, whether played by Sally Field, Karen Valentine, Sandra Dee or Deborah Walley. mark-edk, Flashgear and Jeff Flugel like this. Montytc, Flashgear and Jeff Flugel like this. Thanks for the write-up on Gidget, Mark! I've been thinking about picking up this series on DVD as it's so cheap ($7 on Amazon for all 32 episodes!) and Sally Field was so young and cute at the time. The Flying Nun might be OK, too, but I just can't get my mind around the crazy premise for that one. mark-edk, Flashgear and Rustifer like this. The A-Team - 1.7 "The Out-of-Towners"
The A-Team come to the aid of a N.Y.C. neighborhood being squeezed by a protection racket headed by Yaphet Kotto (sporting an unflattering hairdo). Great guest cast in this one (aside from Kotto: Robert Tessier, Albert Popwell and Jack Kruschen) mostly wasted. It's the usual lighthearted shenanigans, with the highpoint being the team driving a garbage truck into the bad guy's night club and demanding he pay back the shopkeepers every penny strongarmed out of them by his goons. However, there's a real air of dissatisfaction at the end, as the baddies are still roaming free and clear; surely Kotto and co. will simply come right back to terrorize the neighborhood once again after the A-Team skedaddle. Oh, well...thanks anyway, guys. A couple of solid episodes to close out the 4th season of this wonderful and warm sitcom. "Back to Nature" sees supposed "wilderness expert" Barney get lost in the woods along with Gomer, while on a camping trip with Andy, Opie and a bunch of Opie's pals. Once again, Andy bends over backwards to ensure that Barney doesn't look the fool in front of others. "Gomer Pyle, USMC" is essentially the pilot for Jim Nabors' successful five season spinoff of the same name, introducing Frank Sutton as Sgt. Carter. I enjoy Nabors in small doses on TAGS, but the verdict is out on how I'd manage with him as the full-on lead in his own series. I enjoyed this ep fairly well, so might take a flier on the first season at some point. The Westerner - 1.9 "Ghost of a Chance"
It's a real shame that this series, the brainchild of troubled genius Sam Peckinpah, only lasted for 13 episodes (14 if you count the backdoor pilot from Zane Grey Theater, "Trouble at Tres Cruces," which is also on the nifty DVD set from Timeless / Shout! ), as this is truly a special western. Brian Keith stars as rugged, illiterate and very human cowpoke Dave Blassingame, who travels the west with his not completely loyal dog, Brown (played by the same mutt from Old Yeller). Every episode of this brief series is a small treasure, and this one is no different. There's a real Twilight Zone feel to the opening 5 minutes here, as Blassingame rides out of the desert into a Mexican village that seems to have been deserted mere seconds before he got there, ala the Marie Celeste. Eventually, it becomes clear that some no-good bandidos (led by Joseph Dr. No Wiseman) are behind it all. Buxom firebrand Katy Jurado co-stars. From 1984 to 1992, Joan Hickson put the definitive stamp on Agatha Christie's spinster sleuth, in a series of 12 wonderful BBC adaptations of the Miss Marple novels. There have been Marples before and since, but none can hold a candle to Ms. Hickson, with her pitch perfect combination of dithery old bitty act and steely-eyed, implacable machine of justice. This was the second mystery filmed, and it's impeccably cast and steeped in postwar period atmosphere. When a convalescing pilot and his foxy sister rent a house in a small village, they soon find themselves one of many victims of nasty poison pen letters. The local vicar's wife calls in her friend Jane Marple to investigate, and (per the norm for Dame Agatha) soon the bodies start to pile up. Rivals of Sherlock Holmes - 2.9 "The Moabite Cypher"
Another Thames Television series made for ITV in the early '70s, a dream release for fans of Victorian and Edwardian detective stories. Over 2 seasons and 26 episodes, multiple detectives were brought to life by numerous great British thespians of the time, including ghost hunter Carnacki (Donald Pleasance), Prof. Van Dusen, The Thinking Machine (Douglas Wilmer), blind detective Max Carrados (Robert Stephens), Martin Hewitt (Peter Barkworth), Lady Molly of Scotland Yard (Elvi Hale) and many others. Perhaps the most well-known detective of the bunch is Dr. John Thorndyke, played in the first season by John Neville and in this episode by Barrie Ingham. 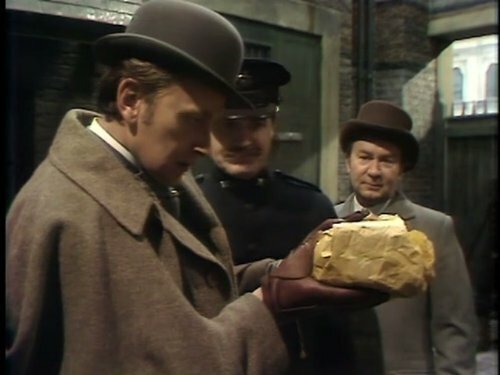 Thorndyke is even pricklier and more arrogant than Holmes, and has his own "Watson" in the form of Dr. Jervis (Peter Sallis). This story centers around a letter written in an obscure form of Hebrew, believed by Scotland Yard to be a code used by Anarchists. Thorndyke comes to the assistance of Scotland Yard to decipher the letter and get to the bottom of the case. Once Julian Glover shows up at Thorndyke's door, you know he's up to no good. While I prefer the Thorndyke story from the first season ("A Message from the Deep Sea"), this is a diverting little mystery as well. The series as a whole is highly recommended if you like this sort of "videotaped play" British telly (which I do). The first season is the stronger of the two, but both are well worth watching and feature excellent casting and witty scripts. I own the Region 1 sets, which are unfortunately OOP, but both seasons are available separately and in a nice Complete Series package in the U.K. for very reasonable prices. Rustifer and Flashgear like this. I was blown away while watching a series on Netflix entitled The Republic of Doyle when I saw one of the main cast members, Irish actor Sean McGinley. Don Porter's doppelganger, do ya think? Doug Wallen, BobO'Link, Flashgear and 2 others like this. One of the rare instances where I disagree with you, Jeff. Compared to Margaret Rutherford, I think Joan Hickson was a poor substitute. Rutherford played the character as one who pursued clues like a raccoon chases trash cans. Joan just seems too passive, and simply reacted to events around her as opposed to actually showing any proactiveness in solving the mystery. I will admit that I never read Agatha Christie's Miss Marple novels--so I can't say which actress matches up more closely with the author's concept of the character. Oh, I can, Russ...Hickson is a spot-on match for the Miss Marple of the novels. Christie herself hated Rutherford's portrayal. I enjoy the Rutherford movies well enough, fun comic romps that they are, but authentic to the texts they are definitely not. I also disagree that Hickson's Marple was too passive...she was just far more subtle and realistic than Rutherford's bulldog approach, yet no less determined to bring the murderers to justice...often putting herself in harm's way to do so. But hey, we can't agree on everything, right? Where's the fun in that? Flashgear, BobO'Link and Rustifer like this. Oh, I can, Russ...Hickson is a spot-on match for the Miss Marple of the novels. Christie herself hated Rutherford's portrayal. I enjoy the Rutherford movies well enough, fun comic romps that they are, but authentic to the texts they are definitely not. Most excellent info, Jeff! I can now happily shut down my mind for the rest of the day since you've shown me the one important thing I think I need to know today. Ha! Well, not quite sure how to read that one, Russ, but I hope you're being facetious. I was blown away while watching a series on Netflix entitled The Republic of Doyle and saw one of the main cast members, Irish actor Sean McGinley. Whoa! The likeness is rather uncanny. Though somehow, I can't imagine Sean McGinley as a sitcom dad. Flashgear and Rustifer like this. Sean's role in the series actually is a sort of comedic role--as a dad, no less. Nah-- I wasn't being sarcastic in my response to you about Miss Marple. I actually appreciate learning something I didn't know. It's Sunday--I really don't need to learn but one thing today. Restful. You should pick this one up. Like Mark said, Field was born to play that role. IMHO, The Flying Nun is OK... but just OK. My sister and I watched it during the original airings but really didn't care for it. It was watched mostly because there was nothing opposite we'd rather have seen. It followed the 2nd part of Batman and was opposite the last half hour of Daniel Boone (which I'd have watched had it not been for Batman opposite the first half) and Cimarron Strip (a 90 minute western). Its 2nd year I *did* watch Daniel Boone the first half of the season but switched back the second half as they'd moved That Girl to follow The Flying Nun opposite Daniel Boone. We didn't watch the 3rd season at all. Whew! I purchased the Mill Creek S1/S2 set sometime back to see if I liked it better or worse and found it was pretty much like I'd remembered. OK but nothing special. That premise is just a bit over-the-top, even for its time of over-the-top series. Even after saying that, I'd still recommend the purchase if you get it cheap enough. I prefer Hickson in the role. If I understand what I've read so did Christie who saw her on-stage in Appointment with Death and subsequently wrote in a note to her, "I hope one day you will play my dear Miss Marple." She *looks* like my mental image of Miss Marple and she acts like I expect her to act. Like you, I enjoy the Rutherford movies but she's just a bit too aggressive for me. Absolutely get S1 of Gomer Pyle: USMC to sample if you liked that episode. The series is pretty much the same as that episode but without Griffith. Sutton is great in the role of Gomer's unwitting foil. The fun part is while Sgt. Carter is constantly reading Gomer the riot act, Gomer is loving every minute. "Oh... it's OK, Duke. Sgt. Carter really loves us!" The Flying Nun might be OK, too, but I just can't get my mind around the crazy premise for that one. The most interesting aspect of The Flying Nun is that an actor can appear in a TV show as substantial as that of cotton balls--which would generally be a career-stunter for most---then go on to win two Academy Awards, three Emmys and two Golden Globes. Life can tell tales as strange as those we make up. Flashgear, Doug Wallen and Jeff Flugel like this. You guys have convinced me to get Gidget, anyway. Can't beat that price - or an 18 y.o. Sally Field in a bikini. Montytc and Flashgear like this. The funny part is The Flying Nun was developed after Gidget was cancelled to keep Field on the air. Field didn't want to play the role in The Flying Nun and considered it silly. Her stepfather, Jock Mahoney, warned her that she might not work again in show business if she did not accept the role so she took it. ABC scheduled Gidget on Wednesday opposite The Beverly Hillbillies, then moved it to Thursday opposite Gilligan's Island, and cancelled it due to poor ratings. That summer the teen audience found it and ratings jumped, landing it in the top 10, but they would not renew it (it was cancelled and you just didn't renew cancelled shows). To keep their newly found star on the air they developed The Flying Nun instead. Gidget is hands down the better series and could have run several seasons had ABC scheduled it better initially or admitted they were wrong and just brought it back from cancellation. Flashgear, Jeff Flugel, ChrisALM and 2 others like this. That's funny...shows you what I know. What series are you referring to, Russ? I've only seen McGinley play sinister types. Last saw him play a corrupt copper in the excellent detective drama, Shetland. He's a terrific actor.